I'm sure you've all heard this saying before: "The definition of insanity is doing the same thing over and over and expecting different results" - which can apply to oh so many things I've done over my lifetime. But recently I had a moment when I realized that I was doing just that when it came to Paco and his allergies. We've been on a (not so) merry-go-round of itching, chewing to the point of infection, vet visit for antibiotics, lather rinse repeat. I cannot bring myself to add up how much we've spent over the last several years on vet visits and medication, but I know for a fact it's much more than we've spent on human doctor visits. Of course we have health insurance while Paco does not, but still. So humiliating. Yu not going to post dis picture on da blog, rite? What I see while I'm at my desk most of the time. I finally had a lightbulb moment last weekend and wondered why on earth I hadn't gotten a second opinion for him. I would have if we'd been dealing with this for a human. I don't know why I didn't think of doing this sooner. Well, I do know - I like his vet well enough, we've been going to that animal hospital for 12 years, and everyone there is really nice. But nice isn't making my dog feel better. So I made an appointment with a vet in town whose name always comes up on message board when someone asks for a vet recommendation. 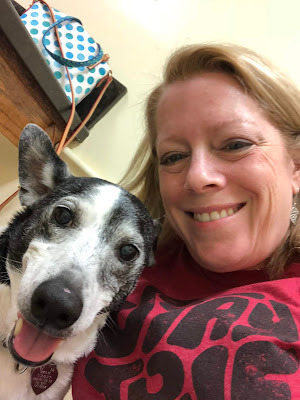 Our traditional vet selfie (we have A LOT of these). Longtime readers know how much Paco likes posing for the camera, and a selfie is a good distraction while we're waiting for the vet. The vet came in and immediately sat on the floor - Paco went right to her and didn't mind being checked out one bit - in fact, he even gave the vet a kiss on her nose. She told me about a new drug called Cytopoint, which is an injection, and is different than Apoquel, which is what we've been using for Paco, although it hasn't been working. Please reference that definition of insanity in the first paragraph to understand why I've been getting a monthly refill of that medicine at $85 a pop even though he was still itching and chewing like crazy. She said that she's been using Cytopoint for about a year and a half and has seen really good results; it cost us about $30 less than the Apoquel, plus it's an injection versus a daily pill. The Cytopoint can last a month, or it can last a few months, depending on the dog. But even if it lasts a month, if it makes Paco not itch and be so miserable, I'm fine with that and will happily bring him in for another injection. I just want his quality of life to be better. 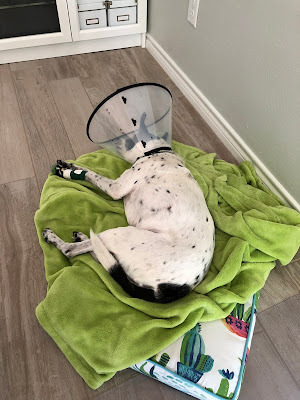 Twenty-four hours after the injection, Paco was much more relaxed and we were able to keep his cone off for several hours, without him going to town with chewing. Several days later I ran my hand down the length of his back and he didn't do that itchy-shivery thing that he does when his allergies are so bad. This medicine is actually making a difference! 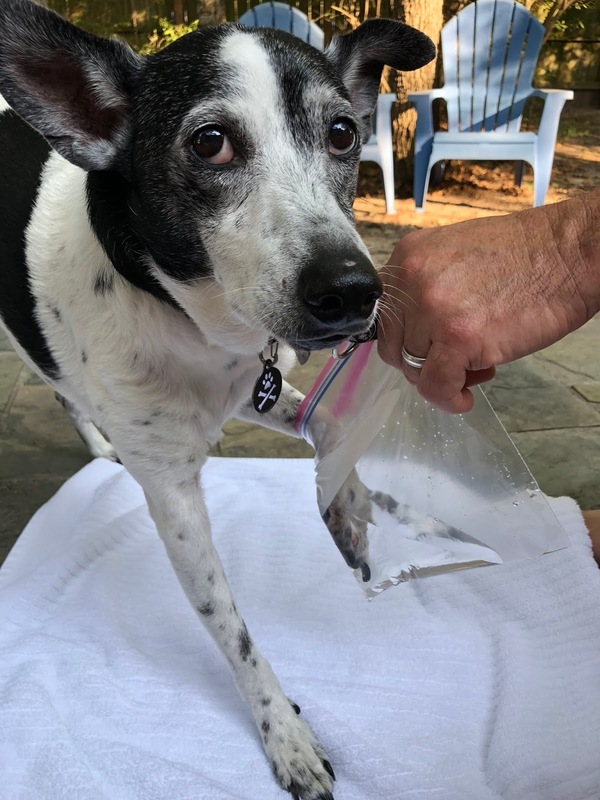 To soothe his inflamed, angry red paws, the vet suggested soaking them in Epsom salts for five minutes per day. He's such a compliant dog that I knew he'd submit to this, and he did. But honestly, we only used the Epsom salts twice, and because his paws were looking so much better thanks to the antibiotic plus him not licking them, we didn't continue with the foot soaks. 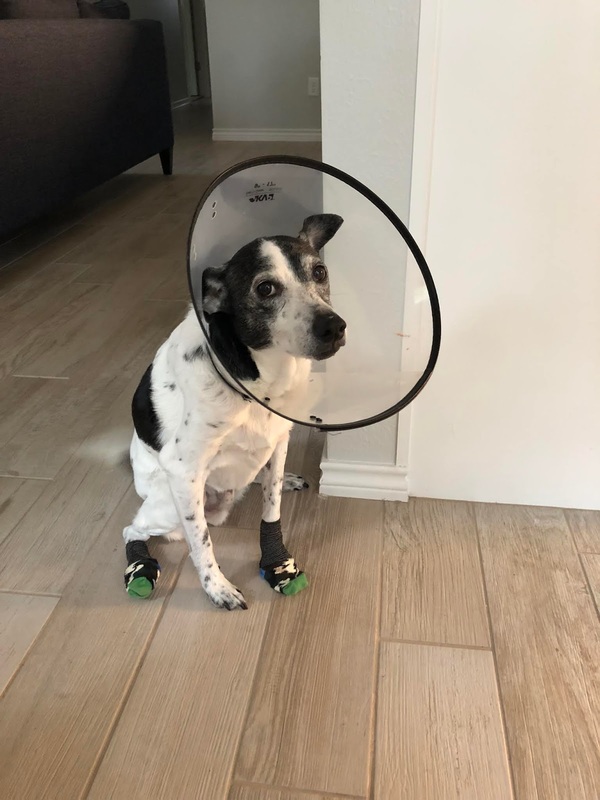 Along with trying something different to relieve Paco's allergic itching, I talked to the vet about his constant licking. He licks his paws, and when he can't get to them, he licks the inside of his cone of shame. She said he might be an OCD licker, which I think is the case. Want to know what she recommends for that? Prozac. Yep, good old Prozac. So we're giving that a try in addition to the Cytopoint; Prozac takes a couple of weeks to work so the licking is still an issue, but just with the Cytopoint, we are already seeing a huge improvement in Paco's itching. Jeff and I are cautiously optimistic about this, and keep checking on Paco, looking for signs that he's getting relief. We haven't watched someone this much since we brought home our firstborn from the hospital over 31 years ago! It took me far too long to realize that I needed to make a change with Paco's care, but hey - better late than never. It was a relief to hear about other options and treatments for him, and bonus, it's even more of a relief to see that the new options are making a difference. I'm just sorry I didn't do this sooner. I'm glad to hear that Paco is doing better! Sometimes changing doctors is in order no matter how much we may like them as people. Who knew Prozac can be for dogs too. I learned something new today. I hope Paco continues to improve and gets back to his regular self. I had no idea Prozac was for dogs, either! I'm glad getting a second opinion helped and I'm glad Paco is starting to feel better! We did that with Heidi when the shelter's medical exam found her to be all clear, even though something was obviously wrong. We've had several subsequent second opinions as a result of moving so much, oops. And yeah, the firstborn definitely gets more attention...and also scrutiny, leaving room for the following kids to get away with more, haha. Well they gave her weeks to months in January, and here we are 7 months later! Our newest vet checked her out about a month ago and she's still doing alright and doesn't seem to be in a ton of pain, so we're just taking it one day at a time. She's telling me we need to draft a new Bucket List, since she already checked everything off the first one. I'm so glad to hear that Heidi is still happy and hanging in there. Wonder what her new bucket list will include? Oh my word, I’m so happy to hear that it seems as if Paco is finally getting relief!!! Yay!!! Me too - it's about time. Dang, and I thought $85 a month for Apoquel was crazy. At least you know of an alternative for Cocoa, in case her current meds stop working. I am so glad Paco is doing better. My dog has been on Prozac for anxiety and aggressive behavior for 8 months now. We adopted him a year ago. He is 6 years old, so he has a lot of issues that are taking some time to sort through. Plus I think animals have the same tendency to become immune to a medication after so many years of usage. Poor Paco! I'm glad to hear the new meds seem to be working for him. That must be miserable to be so itchy all the time. He's sleeping so much better now that he's not itching all the time; he was really bad off, poor dog. so glad your dog is getting some relief. our last dog was on a daily regiment of prozac to curb some anxiety-related behavior (like, freaking out and peeing all over if we walked outside without him (even for a nano-second to bring out the trash). It really helped. I hope Paco gets the same result. That is so good to hear - we are hoping the Prozac helps Paco. So glad he's getting some relief. Oh my goodness, his little paw in the baggie of epsom salts is KILLING ME. I am so glad you are trying something new and that he seems to be getting better! I know, his face when I put in the baggie was so funny, like OK MOM WHATEVER YOU WANT. So good that you trying a new vet turned out to be such a good thing for Paco. I'm with Helen on Paco complying with the Epsom salt soaks--hilarious!! Plus, the vet selfies to keep Pace preoccupied at the vets--Paco looks like he is enjoying himself. Hahahaha I had forgotten about Paco and FF. He is pretty fashionable himself. He misses modeling shawls, LOL. Ughhh, I just hate that Paco suffers with those allergies, and you have had such a treadmill trying to get them properly treated. Happy, happy, happy that Paco boy is getting some relief. And he is a handsome fella, cone or not. I can see your hesitance in going to a different vet. We've been going to our vet for about 12 years and I would feel bad going to someone else but I am glad that you did and found a resolution that seems to be working for Paco. P.S My husband first introduced me to that saying "Doing the same thing over and over is a sign of insanity" and I use to argue that it was just determination...haha. I guess it depends on the situation. So good for you that you tried a different vet and that it's working. As a dog mom it's so hard to see your baby in pain. Especially since they can't tell you what's hurting. When Bella had a distracted knee, my own vet told me to take it easy a couple of weeks. But we didn't think that would do the trick and I found a vet online that was specialized in knees. The minute we came in he saw the problem and told us surgery was the only option. I'm so glad we did it because after the 2 surgeries on her knees Bella never has had problems, she's better than before. Here we can get health insurance for pets, I didn't have one before but when Bella came I took one and glad I did because the knee surgeries were compensated for 75%. Hope that everything goes up for Paco now and that he will be the happy funny dog again soon. Poor Paco! I'm so glad that this new medication seems to be working. It's so hard to see our fur babies uncomfortable and not be able to help. Fingers crossed! For real, fingers and toes! Aww, you are killing me with the kitten joke! I am so glad this worked immediately! And I love the pic of him getting his fance epsom salt soak. Let us know how the Prozac goes! And don't feel bad. We trust our providers - that is why we use them. And you posting this makes me wonder if we should get a second opinion for Data (or, if I should have him see his usual doc, since he had to see the other one last week). ...and you are killing me with your kitten pictures - they are so freaking cute! I am really hoping the Prozac takes the edge off of not only his licking, but his must kill attitude toward all delivery people as well. As for Data, if you know of another vet who is highly recommended, another opinion might be a good idea, especially since he doesn't seem a whole lot better, unfortunately.